An incredible sighting of a flock of birds flying in unison and twisting and turning in mesmerizing patterns has been captured on video and shared online. The aptly titled ‘Magic Cloud’, produced by Marco Campazas, shows nature in its full glory as a flock of starlings come together in a murmuration. A murmuration refers to the phenomenon when starlings swarm together, flying in a whirling swift-changing pattern. 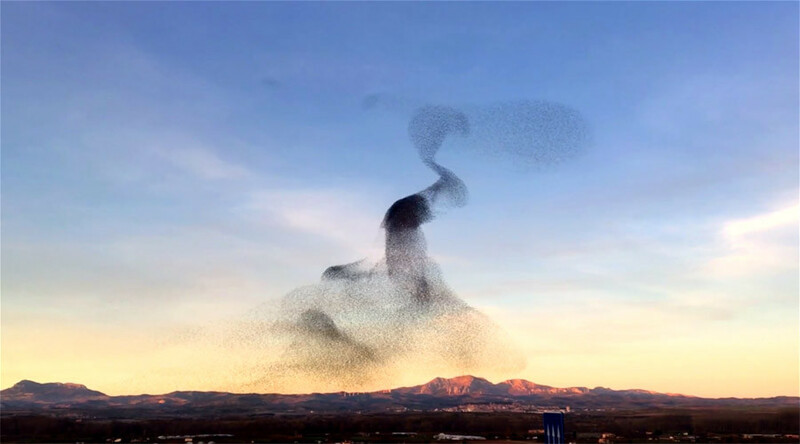 This footage shows the amazing collective organization of the feathered creatures as they aerial dance in a fascinating twisting and turning sequence, moulding into cloud-like shapes. While it doesn’t say where exactly the incredible footage was shot, most of Campazas’ videos, which focus on the beauty of the natural world, were filmed in Spain. The magnificently choreographed movements of the starlings is still somewhat of a mystery to scientists. Recent studies have shown, however, that each member of the flock modifies its position relative to the six or seven birds directly surrounding it, creating patterns going in different directions and at varying speeds. Magic Cloud from Marco Campazas on Vimeo.